Abstract: Pulmonary blastoma (PB) is a rare aggressive lung malignancy with a poor prognosis. Surgical resection is the treatment of choice for localized disease, and there are no standard treatment guidelines for metastatic PB. Due to its rareness, its molecular profile has not been elucidated. We present the first case of classic biphasic pulmonary blastoma (CBPB) with CD74–ROS1 rearrangement in a 44-year-old Asian female with stage IV disease diagnosed using capture-based ultra-deep targeted sequencing. It has been reported that ROS1 rearranged lung adenocarcinoma and squamous cell carcinoma are sensitive to crizotinib, an ALK/MET/ROS1 multitargeted tyrosine kinase inhibitor. However, its efficacy has not been reported in CBPB patients harboring ROS1 rearrangement. 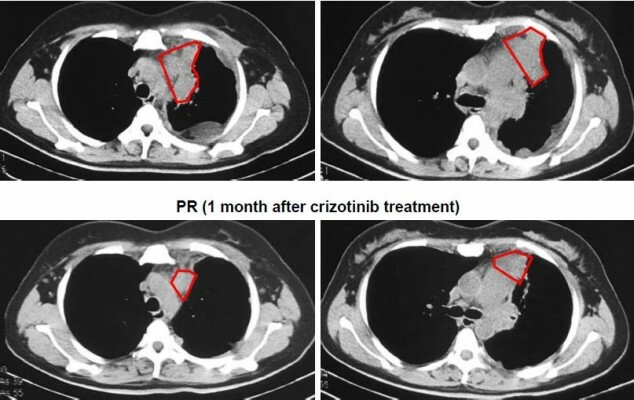 This CBPB patient was given crizotinib and she achieved partial response after 1 month of treatment. We report the first clinical evidence of efficacy shown by crizotinib for targeting CD74–ROS1 fusion in CBPB.